AnonD-314503, 06 Mar 2015Not to mention alpha and note 4's metal frame with chamfered edges are iPhone 5's design..s6 obliterate ip6 on any aspect it even priced more premium now LOL, eat that iphone snob! [deleted post]Not to mention alpha and note 4's metal frame with chamfered edges are iPhone 5's design..
[deleted post]Well build material plus its geometry makes up the look and design and it was yesteryears ago compared to iPhone. And actually its just iPods' design language that evolves. Anonymous, 06 Mar 2015Really? Because I didn't see gsmarena making a fuss about how the iPhone 6 looks like the Ativ S.Ativ S is just a trash compared to iPhone, build materials are at opposite, Ativ is a plain samsung except for the curves. It just doesnt have the bragging rights level iPhones. And let me remind you, that iPhone design language has started way back iPad Mini and iPod touch. Now to mention the original iPhones, only it was small and thicker. hi, 05 Mar 2015I want S6 edge design and hardware with iOS software. I like iOS because, You have more contt... moreHave you ever used an Android? I can do everything that your iPhone does in my Android and much more. I only have 1 major problem with these devices: fingerprint magnet! 2015 and we still have to deal with smudges? Yikes.. I use Xperia Z3 Compact, but I don't have those many smudges on the back of my phone. Previously I use Nexus 4 and it didn't have crazy smudges like S6. Different type of glass/coating? I don't know. But gosh those smudges really annoy me. Should have gone with matte finishing at the back. Fingers crossed that MAYBE it's only because the phones are being held with so many different oily hands during MWC and MAYBE those smudges look so obvious because of the lighting. What I'm really looking forward is for your battery endurance test your test will make me buy or skip the s6. AnonD-314503, 06 Mar 2015"In the end, there will be those that say that Samsung copied Apple. While the similariti... moreReally? Because I didn't see gsmarena making a fuss about how the iPhone 6 looks like the Ativ S.
It's a good looking phone...! Only MicroSD slot is what I wanted...! alekos21, 05 Mar 2015a smartphone is an everyday use device we carry on our pockets hands etc. it should be made of... moreseal it in a plastic bag! "In the end, there will be those that say that Samsung copied Apple. While the similarities are uncanny, there are only so many ways you can make a smartphone, and if lawsuits aren't being filed and patent authorities are silent, so should we. What we held in our hands were two beautifully crafted devices, possessing their own personality, and that's good enough in our book."—meh! Thats it? Im pretty sure if its the other way around, we could find a whole page of discussion relating to design immitation of this from that. I dont find these editors neutral. Well what to do.. This is super phone.. good build quality, gorilla glass 4 front and back panel, processor with 14 nm process, qhd display with super amoled and metal frame . For me 32gb of internal memory is enough for me. Hopefully it's coming soon to indonesia. And I will see the iphone lover will regret their phone. Because iphone 6 has very low build quality. I am impressed with the design, I feel like it's a breath of fresh air, and that is coming from a Sony fan. hi, 05 Mar 2015I want S6 edge design and hardware with iOS software. I like iOS because, You have more contt... moreAre you joking, Android has always had far superior sharing options than IOS. IOS 8 improved them a little, but they are still way behind. Any self respecting user who has played with IOS and Android would know that. It makes me think you have never used Android and are just trolling. So I would like to stay with my S5. Anonymous, 06 Mar 2015Not an attractive phone,looks like mix of iPhone and Sony Xperia,badly done. The camera is to... moreWhat kind of mentality you have. How is S6 looks like iPhone, not even frkn close. Yeah all back face glass phones like Xperia.. But most funny parts is still while you trolling about ip6. Do you really think S6 like ip6? I know you a hater but, being objective is good thing, really makes you feel better. BTW: I have a Huawei phone. Anonymous, 06 Mar 2015Not an attractive phone,looks like mix of iPhone and Sony Xperia,badly done. The camera is to... moreLots of people would disagree with you. Polls have the S6 Edge at 50% of votes. The S6 and M9 both share 25%. 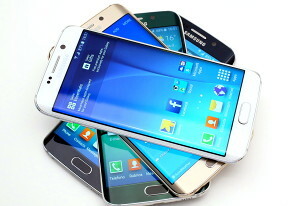 AndroidPolice also said that the S6/S6 Edge have the best build quality. They've at least touched the device for a few days, unlike the armchair industrial designers here on gsmarena and other sites. hi, 05 Mar 2015I want S6 edge design and hardware with iOS software. I like iOS because, You have more contt... moreYou have an option... Try miui... It has all those options you said..
Not an attractive phone,looks like mix of iPhone and Sony Xperia,badly done. The camera is too big for the body and it all looks like we saw it before.